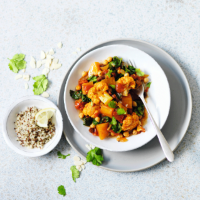 Packed with good-for-you vegetables, this flavoursome veggie curry is a great way to get more of your 5 a day. Serve with the quinoa, some poppadoms, chutney and naan breads for a real feast. 1. Heat the oil in a large saucepan and cook the onion and cauliflower for 6-8 minutes until starting to turn golden and soften. Stir in the curry paste and cook for 1 minute. 2. Stir in the sweet potatoes, raisins, stock and chopped tomatoes. Cover and cook gently for 15-20 minutes, stirring occasionally, until the cauliflower is tender and the sauce is thickened. 3. Stir in the lemon juice, chickpeas and spinach and cook for a further 2-3 minutes. Scatter over the toasted flaked almonds and serve with the white and red quinoa mix. Try swapping the almonds for cashew nuts.